Sad news for everybody involved. Monarch have gone into administration and all flights have been cancelled. 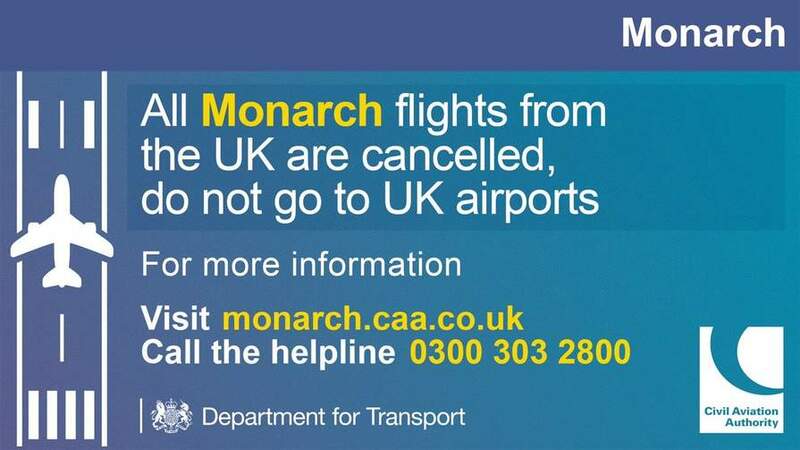 The Civil Aviation Authority has advised Monarch customers not to travel to the airport. Travellers currently abroad for the next 14 days are being informed that they will be brought back to the UK with no cost to them, informing that there is no need to cut short their stay. For further advice and details of your new flight please read I am currently abroad. Further information is available at I have a future booking and have not travellled yet. We are making arrangements for all customers originally due to return to the UK on or before 15 October 2017, to return to the UK on a new aircraft at the end of your holiday, at no extra cost to you. Details of your new flight should be published a minimum of 48 hours in advance of your original departure time. New flights are published in the my new flight back to the UK pages. In the menu, click on the country that you are in and then select the region or town. If your flight is not listed, please do not worry as flight schedules will be updated frequently. Please continue to check the website, ensuring you refresh the page each time. Do not go to the airport unless your new flight details are confirmed on our website or via a text message or e-mail to the lead passenger on the booking. Once your flight is confirmed, please make a note of the new flight details and travel to the airport arriving at least three hoursbefore your new departure time. If your flight was part of a holiday booked with Monarch Holidays we have specific advice regarding your accommodation and transfers. If you are currently abroad and due to return to the UK on or after 16 October 2017, please read the additional information section. This is an unprecedented operation with up to 110,000 customers abroad. Consequently, there may be some delays and we would ask you to bear with us while we make the arrangements. We aim to get you home as close to your original time as possible and we are working around the clock to make this happen. We can assure you that your holiday will not be cut short, as your new flight will not depart before the time of your original Monarch flight. If your original flight was booked as part of an ATOL protected holiday, you may be able to claim for refreshments and additional necessary overnight accommodation. If your booking is not ATOL protected, you are not entitled to make a claim for out of pocket expenses and additional nights of hotel accommodation to the CAA, but you may be able to claim from your travel insurer or your credit card company or other payment method. If you are not sure if your booking is ATOL protected, please see our advice how do I know if I am ATOL protected. Although we will do our best to fly you back to your original UK airport, in some cases you may find that your new flight is to a different UK airport. Unfortunately when arranging flights for so many people this is unavoidable. However, transport will be arranged to transfer you back to your original UK airport at no extra cost to you. Representatives will be there to meet you once you have passed through UK arrivals and provide you with instructions on your transport. Please note that, unless advised, all customers will be required to check-in at the airport. Unfortunately, online check-in will not be available for the majority of flights and all existing boarding passes are no longer valid. This means that there may be longer queues to check-in than normal, so please aim to arrive at least three hours before the departure time of your new flight. At the airport, look out for your new flight details on the screens and proceed as advised to check-in. Please take your original flight tickets or flight confirmation as evidence of your original booking. You will then be issued with new boarding passes for your new flight when you check-in. Please follow the advice below on claiming a refund for your booking. If you booked a flight or holiday with another travel company or travel agent you should contact them directly about your arrangements. They will be responsible for arranging a new flight or providing a refund for your booking. Please do not submit a claim to the CAA. If you are not sure how to identify your travel company or whether you are ATOL protected, please see our advice how do I know if I am ATOL protected. Sad news for everyone involved, glad people will be flown home organized by CAA. Sad news for everyone involved, glad people will be flown home organized …Sad news for everyone involved, glad people will be flown home organized by CAA. It would be sensible to have insurance for an extended holiday so hopefully they'll be covered by travel insurance. had flights only booked for June next year, already sent my chargeback claim to get my money back. Really feel for the employee's though, and can't help but wonder why the government didn't step in to help try and secure the jobs, with all the interested buyers that were on the scene. Though perhaps this is the moment the buyers were waiting for and can negotiate a much better deal for parts of the business. Hope the majority of jobs can be saved. 'we've closed down and this page will no longer me monitored '. Anyone have a brief explanation for the demise of this company? I knew I shouldn't have booked a flight for Friday 13th..
Their Twitter page:'we've closed down and this page will no longer me …Their Twitter page:'we've closed down and this page will no longer me monitored '.Great. Thanks for that. Pretty sure that's quite standard for a company that's gone into Administration, everything is handled by the administrators so not some work experience lad on the Twitter desk at Monarch HQ. Were you expecting someone who's just lost their job this morning to keep the page going on a voluntary basis? I'm confused. Were you expecting someone who's just lost their job this …I'm confused. Were you expecting someone who's just lost their job this morning to keep the page going on a voluntary basis? I would expect someone from Monarch or the administrators to arrange for at least one person to be available to monitor the Twitter page to answer questions from worried customers. According to the Chief Exec. So the banning of flights to Sharm from the UK, less revenue, bit of brexit currency rate shenanigans and EasyJet and RyanAir have given them a good kicking in the market. One possible upside is that the Monarch pilots can get jobs with Ryanair, although they may not want to work with Ryanair's culture. According to the Chief Exec.“The root cause is the closure, due to t …According to the Chief Exec.“The root cause is the closure, due to terrorism, of Sharm-El-Sheikh and Tunisia and the decimation of Turkey.”So the banning of flights to Sharm from the UK, less revenue, bit of brexit currency rate shenanigans and EasyJet and RyanAir have given them a good kicking in the market.One possible upside is that the Monarch pilots can get jobs with Ryanair, although they may not want to work with Ryanair's culture. Talk about luck of the Irish. Looks like this misfortune will eventually get someone out of a Michael O'Leary sized hole. Sad news indeed.Anyone have a brief explanation for the demise of this …Sad news indeed.Anyone have a brief explanation for the demise of this company? they weren't successful enough vs. their competition. I would expect someone from Monarch or the administrators to arrange for …I would expect someone from Monarch or the administrators to arrange for at least one person to be available to monitor the Twitter page to answer questions from worried customers. They have setup a website and a telephone hotline. Given that they have 100,000 people to get home I think shutting down their Twitter page isn't unreasonable. They have setup a website and a telephone hotline. Given that they have …They have setup a website and a telephone hotline. Given that they have 100,000 people to get home I think shutting down their Twitter page isn't unreasonable. You think that one person would be able to deal with the twitter questions of hundreds of thousands of people? You think that one person would be able to deal with the twitter questions …You think that one person would be able to deal with the twitter questions of hundreds of thousands of people? i would have gone to at least 3. and an intern. Ashame... They were a good budget airline imo. or as bad as dying. Its all relative so please dont apply judgement on people who are peeved at losing their holiday, its only natural. or as bad as dying. Its all relative so please dont apply judgement on …or as bad as dying. Its all relative so please dont apply judgement on people who are peeved at losing their holiday, its only natural. you reap what you sow, you reap what you sow. O’Leary said: “Both Monarch and Norwegian are in trouble. It’s an open secret among airlines that Monarch and Norwegian may not survive through the winter. They are burning cash. at least there will now be extra pilots literally desperate for work, on …at least there will now be extra pilots literally desperate for work, on what ever terms they can get, I bet the ryanair pilots that have been causing trouble are shitting a brick now....you reap what you sow, you reap what you sow. Not really seen as none of them will be type qualified to fly a 737 that Ryanair operate. And when you say Ryanair pilots causing trouble, I assume you mean taking their annual leave they're entitled to take? Do you think maybe Ryanair haven't hired enough pilots if they can't afford to let their pilots take a holiday? 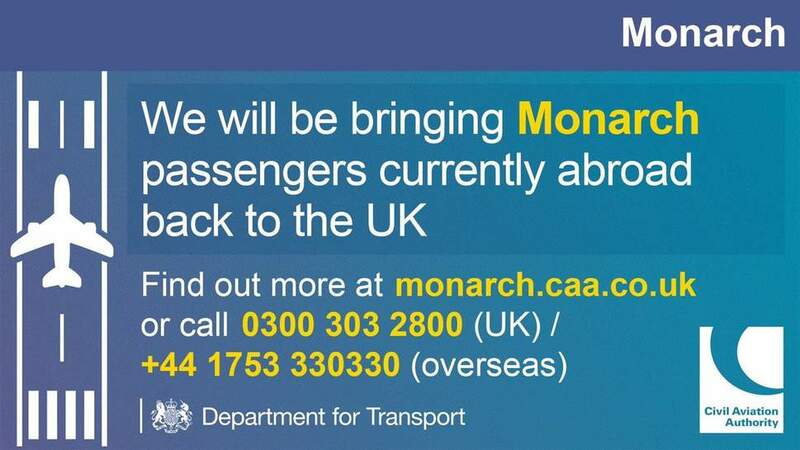 Monarch's collapse is not so surprising when you realise that they had already been rescued from near-collapse in 2014 and only just managed to stay in business this time last year after the Civil Aviation Authority allowed them a 12 day extension to give them extra time to find the funding they needed before the CAA would grant them their annual ATOL licence. …http://www.travelweekly.co.uk/articles/286590/oleary-claims-norwegian-air-running-out-of-cashO’Leary said: “Both Monarch and Norwegian are in trouble. It’s an open secret among airlines that Monarch and Norwegian may not survive through the winter. They are burning cash.